Rotel RC-1572 on hyvin monipuolinen stereo-etuvahvistin. Useilla sisääntuloilla varustettu etuvahvistin sisältää AKM D/A-muuntimen joka kellottaa signaalin 32bitin ja 768kHz taajuteen, joten digitaalilähteet saavat mahdollisimman hyvän muunnoksen ja analogipuolella löytyy sekä RCA- että XLR-tulot ja lähdöt. Tarkasti soivalla MM-levysoitinliitännällä on vinylinkuutelukin erittäin nautittavaa. Rotel RC-1572 on laadukkaan päätevahvistimn tai aktiivikaiuttimien paras kaveri. The RC-1572 provides an entryway into higher performing separate components with all of the analogue and digital inputs required by today's sources. 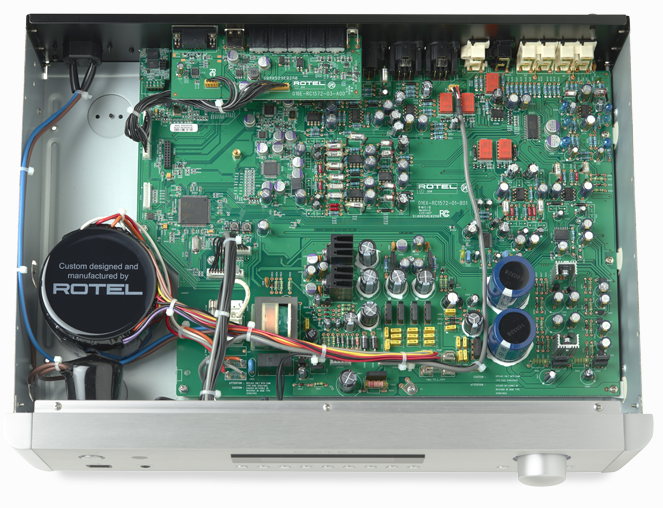 The heart of an uncompromising audiophile stereo “separates” system is the preamplifier. Separate components hold the promise of the best possible fidelity, since each device is optimised for its role in the sound reproduction chain. The new RC-1572 stereo preamplifier leverages the design of our flagship RC-1590 preamplifier including its 32 bit/768kHz AKM stereo digital-to-analogue converter to handle critical signal conversion. Among many refinements, the RC-1572 utilizes relay switching for analogue sources instead of an IC based switch to maintain the integrity of the signal path for RCA, phono and XLR inputs. Beneath the clean lines and user friendly fascia of the RC-1572 lies highly sophisticated engineering. Both analogue and digital sources have been given equal consideration as today’s listener often has several digital sources, but may also enjoy legacy formats like vinyl LPs. 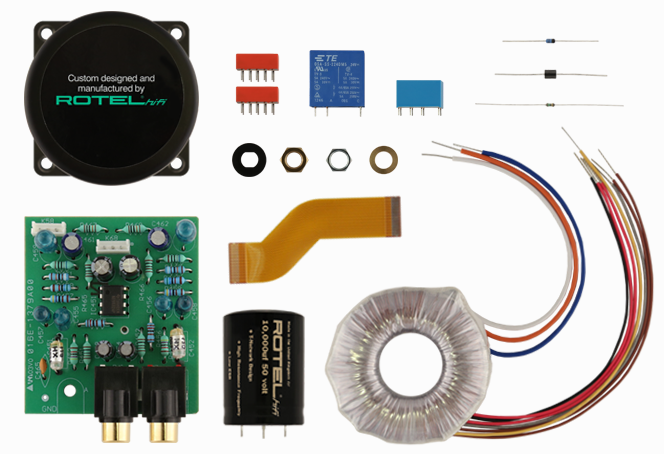 A large toroidal transformer and regulated power supply ensures stable current and voltage requirements to all stages under dynamic conditions. Premium circuit components have been selected only after extensive listening evaluations. Careful routing of all low level signals has been practiced to ensure impressive signal to noise levels. The result is effortless musical dynamics, impressive detail and scale. The RC-1572 stereo preamplifier is also extremely flexible. Four digital inputs (2 coax and 2 optical), plus the rear PC-USB handle digital sources up to 32/384 resolution. The 4 inputs are designed for sources such as TV set-top boxes, flat panel TVs or Blu-ray players for stunning playback. Importantly, it is possible to fix the level and set an auto-on option with digital inputs for use with devices that provide their own volume control for convenient “hands-off” use.The PC-USB input supports DSD signals. Integrated Bluetooth aptX is provided. Analogue inputs include balanced XLR connectors, perfect for connecting the RCD-1572 via its XLR outputs, in addition to four pair of conventional RCA inputs. A moving magnet phono stage rounds out the source capability. XLR and single ended outputs are provided along with a mono subwoofer output, as are two 12-volt triggers to control on/off operation of an amplifier and/or other components. For custom integration, control options include RS232 on a standard DB9 connector, as well as an Ethernet port for IP control and software updates. In short, the RC-1572 is a tremendous value and the perfect upgrade for owners of older analogue-only preamplifiers.